‘If you don’t know where you’re going, you might not get there‘, Yogi Berra, a famous baseball player famously said. Berra knew how to achieve and win, appearing in 21 world series and winning 13 of them. He was elected to the baseball hall of fame in 1972 (Wikipedia). If we want to achieve something, we usually define our goals, measurements and targets. We usually make a clear plan with timelines, milestones and resources so we can execute. If we implement something as complex as S&OP – a process that can take years to work well – we will clearly define where we’re going right? 36% of S&OP processes have clear defined maturity levels. 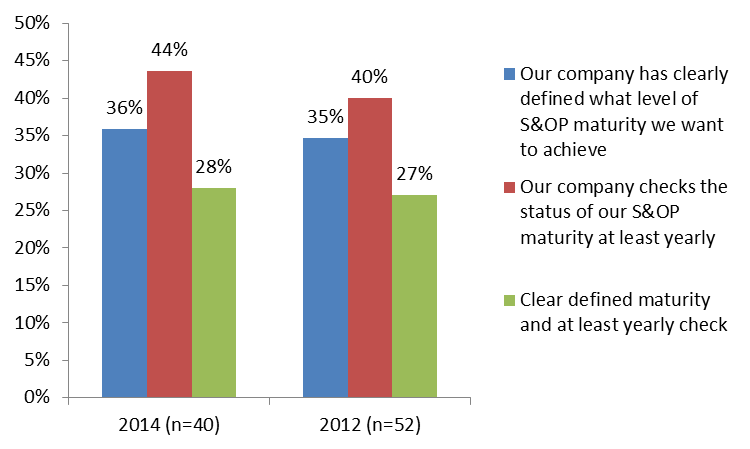 44% actually checks their S&OP maturity at least yearly. 28% of participants answered that they set both clear targets and measure them yearly. These numbers are not any different than in 2012 as we can see from the graph. 2010: Gartner found in 2010 that 67% of companies can’t get further then step two from their four step maturity model. An Oliver Wight white paper on the transition from S&OP to IBP tells us that most companies ‘get stuck in between Stage 2 and Stage 3’from a four stage model. 2014: In the book Bricks Matter, we can read that‘36% of companies’ S&OP processes are stalled or are moving slowly’. People skills/resources: how can the right resources and skills be, purchased or developed and allocated if we don’t know our goals? Improving people and organizational hard and soft skills can even be defined as an S&OP goal. Senior leadership support: this has been the number one or two roadblock in four S&OP pulse checks since 2010. But do leaders know exactly what to support and for how long? Do they support a project, a process or achieving certain KPI’s? Leaders can’t be held accountable for lack of S&OP achievements if measurements and targets are not agreed and integrated in their performance plan. The organizational silos: without clear common goals to work on beyond functions, it is unlikely for collaboration to appear and for silos to be crossed pro-actively. These three key S&OP roadblocks are all highly influenced by the lack of S&OP goals, measurement and target setting. That’s why I think a lack of goal setting is simply the number 1 reason that S&OP implementations fail or don’t get to the desired maturity. If you want to have a successful S&OP, make sure you know where you’re going. Set clear goals, measurements and targets and integrate them in performance objectives, so people can be held to account to deliver S&OP results or ‘you might not get there’. Agree in all. I would add that Push models just will not make any S&OP process viable. Half of the meetings are trying to agree on a forecast and the other half deals with the reasons why the last period forecast was wrong. David, do you mean a push model where shipments are the result of business presume rather than consumption? Great article Niels! Like how you explored the top three S&OP roadblocks – very straight to the point.